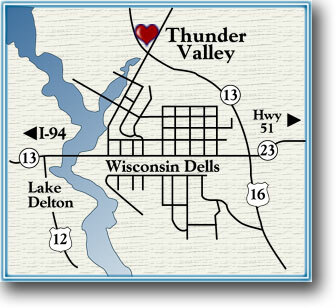 Thunder Valley Inn is located just north of Wisconsin Dells on Highway 13. Take Exit 87 (Highway 13 North) from I-90/94. Go 2.4 miles east through downtown Wisconsin Dells to the stoplight (junction Highways 16, 23 and 13). Turn left, continuing on Highway 13 North for approximately one mile. Watch for our sign on the right, just over the narrow bridge.